Let’s talk about butter. Yes, butter. Not to surprise, Julia Child’s favorite ingredient was butter and I’m sure she spoke from her heart when she said, “with enough butter, anything is good”. In fact, Child used to affectionately compare her husband, Paul Child as the butter to her bread. I as well love butter. Life without butter would be like a life without garlic- dull and gloomy. We wouldn’t have croissants, flaky pie crusts wouldn’t exist and steamed lobster just wouldn’t be the same. Oh my. Butter seems like an ordinary staple but there is much room for growth and versatility. I’d like to introduce mantequilla avellana, which translates to hazelnut butter also known in English as brown butter or beurre noisette in French. Yes, hazelnut butter is brown in color and thus ‘brown butter’, but the title does no justice to the magnificence of this classic French technique. Simply said, the butter is cooked until brown and a wonderful nutty aroma develops. France coined the term noisette-hazelnut for the dark amber hue and distinctive taste. Regarding the actual chemistry of hazelnut butter I turned to the Godfather of cookery science, Harold Mcgee (he’s my hero). According to McGee “cooks heat whole butter until the water boils off and the milk solids turn brown, which gives the fat a nutty aroma”. Butter comes from churning cream which results to an emulsion of water and fat. Basically, heating the butter to a certain point will cause the water to evaporate and you are left with all the good stuff, nutty fat. Yum. Whether you venture on the recipe below or not, try the experiment of making hazelnut butter. You’ll be delightfully surprised with the chemistry of butter. 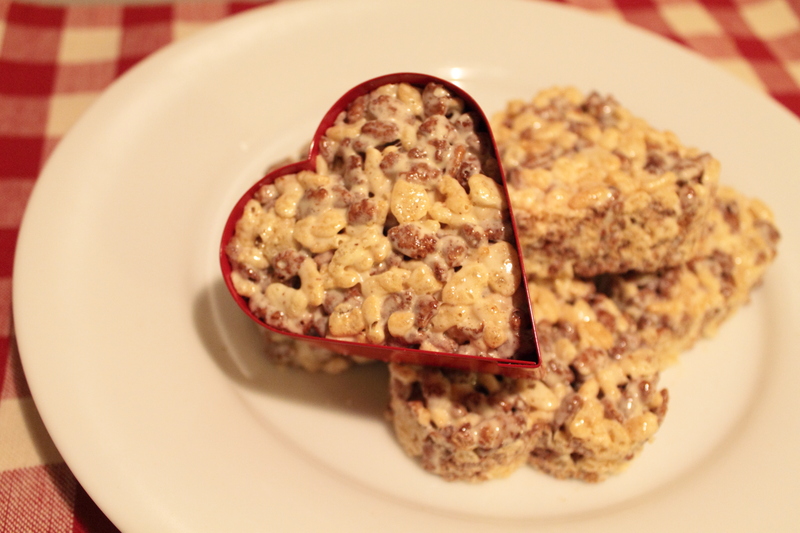 Now, I present Hazelnut Butter Rice Krispy Treats! There are endless ways to cook with hazelnut butter but I found this one simple and promising. The recipe is from Smitten Kitchen and as usual, Deb knows what she’s cooking. The only difference I made was adding half chocolate Rice Krispy because I had it in the pantry. In a large pot melt butter over medium heat. The butter will melt and foam will surface. Whisk frequently with a a whisk to keep pan from burning. The foam will evaporate and the deep yellow will quickly turn brown. Take a whiff! The butter by this time will have a deep nutty, almost caramel aroma. If you have an instant read thermometer, the butter is ready at 150 C/ 300 F. *Click here to connect to Simply Recipes for a step by step tutorial of browning butter. At low heat add marshmallows in 3 parts with a large spatula, mixing well to melt marshmallows. Remove pan from heat add cereal and mix well to distribute butter mixture evenly. Pour mixture into the prepared pan and press down with a wooden spoon or by hand (I took the advice from Smitten Kitchen and pushed down with a piece of parchment paper sprayed with some oil and it worked great). Allow treats to cool and cut into squares or use a cookie cutter to create shapes. This entry was posted in Taste and tagged brown butter, do, harold mcgee, jeno, julia child, mantequilla avellana, rice krispy, taste. Oh wow, this looks and sounds positively evil! Yummo! Haha, absolutely right. We’re a group of passionate foodies. When we first started preparing for H&L, I think 80% of people responded “food/bev” for their first choice. Oh my, I just lost words… this… THIS…! Yum! I make clarified butter from time to time, which is similar, but not cooked as long. I’ll have to try it out, thanks for sharing!